Most of us depend on rice, pasta and potatoes as side-dish standbys. However, there’s a world of other interesting grains out there to explore: couscous, quinoa, barley and bulghur, for example. They provide that carbohydrate kick with a twist, and a different texture or flavor is always worth a try. This guide will explain the differences between various grains, and try to inspire you to try something new. Bulghur, a form of wheat, is the base of taboule salad. A Middle-Eastern staple and the base of taboule salad, Bulghur refers to wheat kernels that have been boiled, dried and crushed. It is available in fine, medium and coarse grinds. How to cook it: Put one cup of bulghur in a small pot with one and a half cups of water. Bring to a boil and then cover and turn heat down to a low setting. Cook for 15 minutes. How to use it: Bulghur is good in salads, pilafs and meat and vegetable dishes. The spongy texture of couscous goes well with stews and saucy dishes. Native to North African countries, couscous is a grain that’s often served with meat and vegetable stews. Its soft, spongy texture really absorbs sauce or liquid. Couscous granules come from semolina, which is the form of wheat that goes into making pasta. The great thing about couscous is that it takes six minutes to cook. Here’s startcooking.com’s tutorial on How to Make Couscous. Quinoa is great in savory dishes and as an alternative to oatmeal. Photo courtesy of Susan at Feasts and Fotos. A grain native to the Andes, quinoa grains are actually the seeds of a leafy plant. Quinoa has a distinctive crunchy texture, and a slightly nutty flavor. In terms of nutrition, quinoa is rich in protein and it’s gluten-free. Look for quinoa in health food stores. How to cook it: Bring one part of quinoa and two parts of liquid to a boil. Cover and simmer for 15 minutes, until the grains are transparent. How to use it: Quinoa is great as a warm side dish, mixed with seasonings and beans. It’s also good in salads, like this Quinoa and Black Bean Salad. 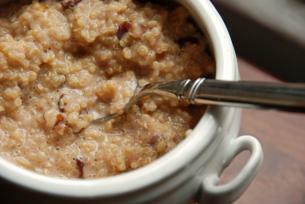 For those looking for a change from oatmeal, here’s a recipe for Quinoa Porridge. 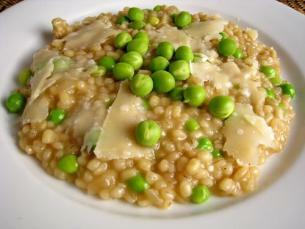 Barley can be used as a base for many side dishes, including Pea Barley Risotto. Photo courtesy of Kevin Lynch at Closet Cooking. This grain, which comes from the grass family, is well known for its high fiber and health benefits. It’s important to remember to buy whole barley (or hulled barley), as opposed to pearl barley, which has been processed and is not considered to be whole grain. Barley is well-known as an addition to soups and stews, but its chewy texture also makes it a great side dish. How to Cook it: Use 2.5 to 3 cups of water per cup of hulled barley. Bring the water to a boil, then add the barley, cover the pot, reduce heat to low and cook for about 1.5 hours. This Beef, Leek and Barley Soup from Smitten Kitchen, delicious! Grandma’s Grain Recipe, makes a big batch of mixed, cooked grains that you can use to make hot cereal, or as a savory side dish. Brown rice is chewier, nuttier and healthier than white rice. Startcooking has tutorials on making white rice, brown rice and fried rice on the stove. It’s also possible to bake rice in the oven, as this recipe for Oven-baked Brown and wild Rice demonstrates. Keep in mind that brown rice is the healthiest choice. This is actually a kind of seed, rather than a grain. It’s got a hearty, chewy texture and is even healthier than brown rice, containing lots of protein, calcium, iron and potassium. How to cook it: Cook one cup of wild rice with three cups of water. Bring the water to a boil, cover and simmer over low heat for 35 to 55 minutes (or until the water is absorbed). How to Use it: Wild rice makes an excellent warm side dish, and is also delicious in cold salads. Pioneer Woman serves up an excellent tutorial for Fresh Corn With Wild Rice – a side dish she recommends for Thanksgiving. Eating grains in their whole grain form (as opposed to their processed form) has been shown to have a host of health benefits. Studies report that regular consumption of whole grains reduces risk of heart disease, stroke, cancer and obesity. Refining processes typically remove 25 per cent of the typical grain’s protein and many other nutrients are lost. Although most grains will have cooking instructions on the package, here’s a handy guide to grain cooking times. Toasting grains before cooking will make them more flavorful. To toast the grains, spread them out in an even layer in a frying pan and heat for a few minutes. Stir them so that they don’t burn. Grains can be cooked in water or broth, or a combination of the two. Cooked grains keep for 3 to 4 days in the fridge. You can freeze any leftovers to use later. You are right. When it comes to grains, many first think of rice but there are several others like barley. Many will be amazed at how wholesome and nutritious some of these lesser known grain are. Whole grains are actually best as it maintains the nutrients. A great way to sample some of these grains is right at the grocery store. Many grocery stores have started making all sorts of really fantastic grain salads for their salad bar.